My Neighbour had an old cedar gazebo that he didn’t want any more and his plan was to take it to the dump. The overall structure and the floor were in good shape, but it needed a new roof and some TLC. A couple of years ago we removed our shed to build a new second story deck and I was always dreaming of a new shed in our backyard. I had even marked out the spot for a 10×10 shed. I was originally going to use plans for a shed to build a new one, but I decided to convert his gazebo into my new shed. So instead of taking the wood gazebo to the dump, we removed the cedar shingles and walls and built a new shed. 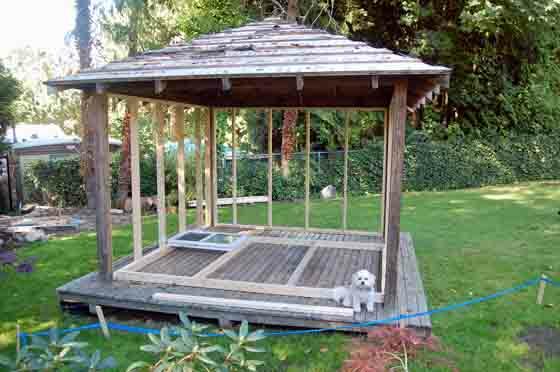 Of course there is more to it than that and in this article I’m going to discuss how to build a shed from a gazebo. Finishing touches -> door, painting, etc. In this article I will discuss steps 1 to 4 and in the article next week I will finish off the project and discuss steps 5 to 7. Once the second article is posted I will add a link to it from this article. Luckily our lots are side by side and we were rebuilding the fence so we could basically drag it from one property to the other. We used a couple of different methods to move the shed onto my property. Before we move it, we removed the cedar shingles and most of the side walls. This was to reduce the weight of the shed. It was important to leave some of the walls up and braced it a bit so it would not fall apart as we moved it. A few weeks later another neighbour was using a bob cat to do some work in his yard and we used it to drag it onto my property. After all of the dragging the gazebo was starting to look a little wobbly and crooked and we decided we needed to frame the shed to add support before we moved it any more. My backyard is sloped, so before we could start working on it we made sure the floor was level and square. This was done by propping up the sides to make it level and also sturdy so it wasn’t going to move around while we worked on it. Then off to we went to Home Depot to get 2 x 4s and lots of them for the framing. As you can see in the photo we made each wall like a panel on the floor of the shed and then moved it into place. This was pretty easy to do. We cut the top and the bottom 2x4s to the length of the shed minus the size of the corner posts. Then we cut the 2x4s for the sides and screwed them all together. Then we cut and studs and screwed them to the top and bottom plate. You can nail everything together, but I like to use deck screws. Since the 2x4s will be covered with cedar siding and away from the elements I used the pine 2x4s available at Home Depot. So nothing expensive here. We did not screw the panels to the shed floor yet. This was because the original gazebo floor was bigger than the shed and I wanted to cut it down a bit. We used crowbars to left the shed up from the corner posts and slowly move it into place. Once this was done we cut down the sides of the floor to line up with the walls and then screwed it down. I had already picked out the spot where the shed was going to go and had been dumping dirt from the garden to level out the pad. My plan was put down nine concrete pavers that were 1’x1’. These would line up with the three posts that were on the bottom of the old gazebo, or new shed. Usually you prepare your foundation first and then you build your structure on top of it. This was a bit different because I had to prepare the foundation and then slide the shed into place. So I had to make sure the pavers were perfectly lined up and level. Instead of making the entire 10×10 foundation level, I made sure it was pretty close but then focused on making sure the concrete pavers were level front to back and side to side. 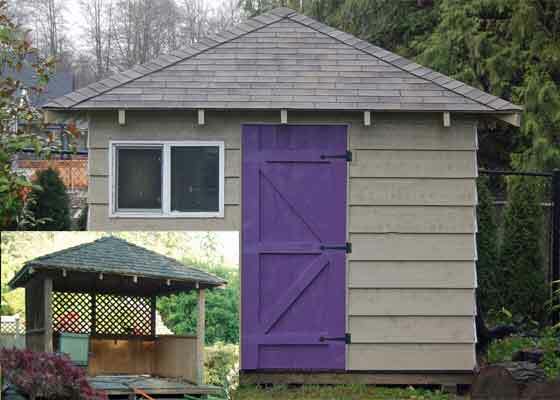 This save me a lot of time and no one would be looking under the shed when it was finished anyway. 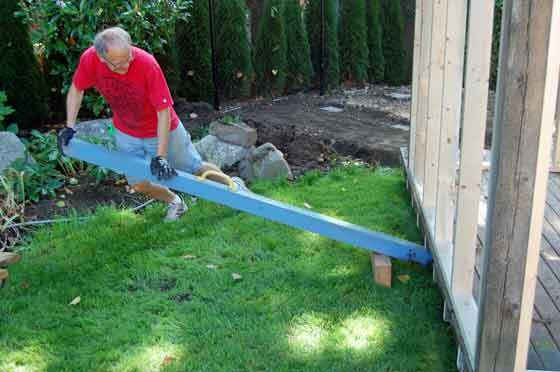 The main thing was to ensure the foundation was stable and the pavers that support the shed are level. We wanted to wait until the shed was in its final resting place before we put the cedar siding on. This was to keep the weight down for the move. The framed shed was pretty sturdy but we did add a few temporary braces just to make sure it wouldn’t move. We first tried to move the shed by leveraging from the back with two big posts and moving it forward. This didn’t work so well because it was digging up the lawn as we pushed it forward. We then found a much better technique that you can see in the photo and the short video below. We placed blocks near the sides of the shed and then used old fence post to leverage it in the air and then pushed the post backwards to move it forward. This was kind of like rowing the shed forward. I was very surprised how well this worked and how quickly we were able to move the shed. Once the shed was on the foundation we checked to make sure the main posts were on the pavers and the floor was level. Everything was perfect and now we were ready for a break. Two read part two of this article, please click here.